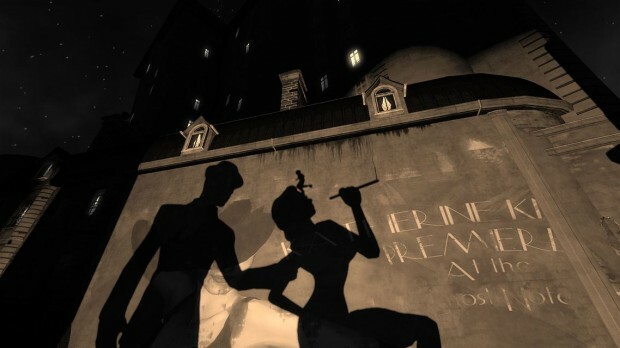 Tactiques d’ombre – Outside of its metaphorical purposes, the shadow mechanics that define Contrast serve two key roles: gameplay and story. The platforming is rather simple but works exceedingly well. Dawn is able to warp into the shadows and use objects’ shadows as means to jump around and reach destinations, leading to some rather intelligent level design. 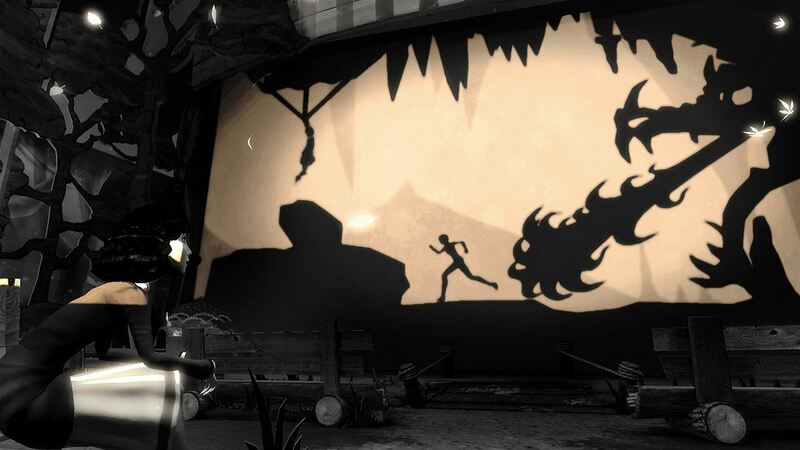 For example, the player can be tasked to position an object at just the right angle in front of a light source to cast a specifically angled shadow to reach higher platforms. Another puzzle included using carousel horses’ shadows as platforms. There’s even a segment in which you warp into a motion picture, leading to a very Limbo-like experience. The shadows also serve to portray the plot. The only real people in the game that you encounter are Didi and Dawn; all other characters are shown as their shadows in cutscenes, which surprisingly works extremely well despite the minimalistic character views. All emotion and motive is shown through body gestures and voices, an impressive feat by both the animators and the actors. 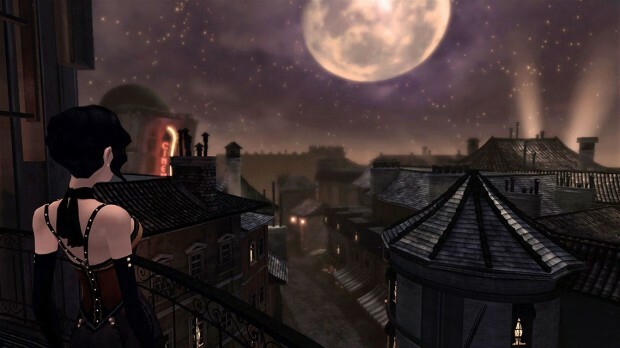 These shadowy cutscenes even serve as platforming segments for Dawn, creating an effective symbiosis of narrative and level design. Innocence de l’enfant contre ironie dramatique – Didi sees the surface, the outer shell — she’s a child who has yet to uncover the darkness of the world. Yet, the audience sees the shadows, the extra layers. The darkness. Didi’s innocence serves as a necessary plot device that conveys her motivation to reunite her family. As the story unfolds, however, we discover the characters’ darker sides. Just a taste: her mother performs at a club at night, her father has many debts and a mysterious illusionist comes to town. The story unfolds in three acts and discovering these characters is both fascinating and harrowing. The entire town itself is partially alluded to being a figment of Didi’s imagination, as the levels’ edges end into infinite abysses, because Didi simply does not know of the outside world yet. The player feels happy because Didi is happy, but sad because of sympathy for the depressing nature of the main characters’ lives. Both emotions are felt throughout, and, even better, often together. 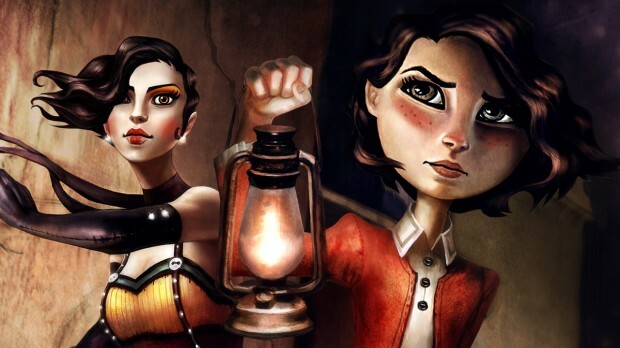 Deux protagonists féminin – In the current culture of under representation and, worse, inaccurate representation of women in video games, it’s highly refreshing that Contrast boasts not only one, but two female leads. Dawn might wear a somewhat sexualized costume, but not once is her sexualization brought up. Instead, Dawn, as the silent protagonist, is defined by her acrobatics and physical strength. Didi, meanwhile, is defined by her creativity and sense of adventure. These traits are often associated with young boys, but Compulsion Games exemplifies them as not being gender-specific, because they aren’t. Creativity and problem-solving are healthy tools for the development of a child, and it’s excellent to play a game that suggests every child should pursue these traits. 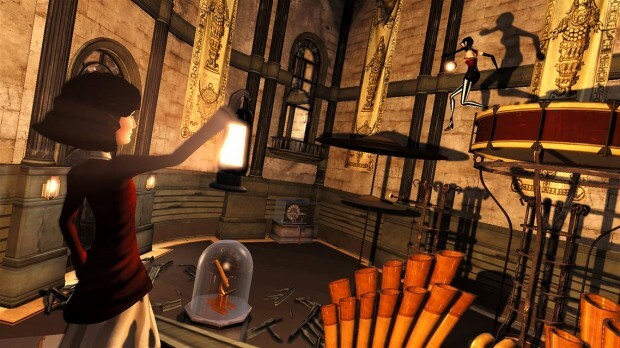 Il y a toujours un phare – Whereas the first act deals with family and the second act deals with fixing your father’s debt, the final act of the game explores the physics and mysteries surrounding who exactly Dawn is and how her powers work. The third act is quite simply worth the price of the game, as your head begins to spin and you question the entire physics and reality of not only the game, but your own life. Complimented by excellent mysterious ambient music and skillful platforming, the final act is truly an intriguing and fascinating experience to behold. Des petites chicanes – After playing Contrast on both Xbox 360 and Xbox One, it’s safe to say a lot of the platforming bugs have been smoothed away. There’s still a few instances during which you’re unintentionally squeezed out of the shadows back into reality and moving is just a tad sensitive, but these quibbles do not hinder the game too much and never felt frustrating. The other small gripe is the game’s length. The average first time playthrough is around 4-6 hours, but the story and intrigue holds up to any notable feature film today, thus justifying the $15 price tag. Even better, when it hits a sale, Contrast will be a steal. Quick but slow. Happy but sad. Light but dark. Contrast is not only one of the best titled games on the market, but it’s one of the best games to hit the downloadable Xbox space so far this year. Much like Limbo, Braid and Fez, the emotional depth and intrigue transforms it into an experience rather than a game. 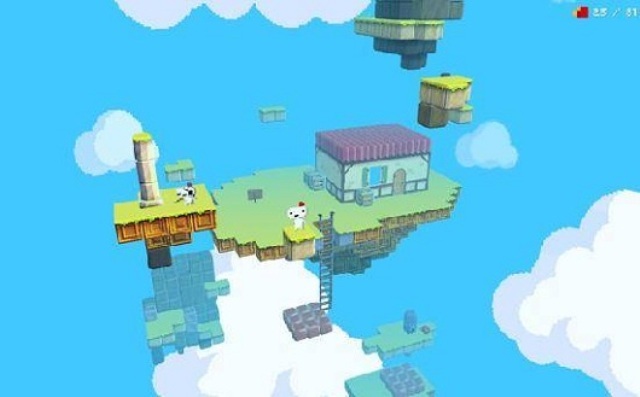 Why has it taken Polytron so long to complete Fez?